Fundraising event ideas don't come more fun and more colourful than holding a RAINBOW FESTIVAL. Is easily understood and has mass appeal. Will stand out from the crowd of competing Summer Fetes and other fundraisers. Is simple to organise and set up. Allows you to try out some new and novel fundraising ideas. But still has room for all your favourite tried and tested fete ideas. There is no point in coming up with unique fundraising event ideas if you don't make the most of them. The great thing about a Rainbow Festival is that all the posters, flyers and advertisments can be wonderfully colourful. Don't miss this opportunity to make your fundraising event and your organisation really stand out. A kid's poster competition is a great way to get the ball rolling and begin the promotion of your event. Radio stations and the local press too love novel fundraising ideas. Anything that makes a change from the usual round of worthy but "same every-time" events. So make sure that you give them all the details they need and encourage them to do a special feature. A Rainbow Walkabout the week before in your town centre with brightly dressed people handing out flyers etc is also a great way to advertise your forthcoming event. This is one of the major ways you will fundraise at your festival. It also makes a great backdrop for any entertainment or announcements such as the Raffle Draw. Cut sheets of hardboard (or cardboard at smaller events) to form a nice big arch. Attach it to scaffolding, a wooden framework or a wall. Visitors to your festival will now be offered the opportunity to buy (or make a donation for) a square of coloured card. On this they write a message of support and attach it to the arch. In this way the rainbow slowly begins; hopefully to be completed by the end of your event. You might like to put a few "fake" cards in appropriate positions to start the Rainbow off and make sure everyone gets the idea. Don't forget the kids. You could also do a smaller arch for children. Kids will love to draw a little picture, write their name and then importantly pin their card on to the arch! The Rainbow Arch idea also works particularly well for Hospices and Hospitals where people can use the cards as little messages of remembrance for loved ones etc. Good fundraising event ideas are the ones that people can easily relate to. This one needs to be advertised well in advance so let the local schools, libraries etc know. In this way it also serves as a bit of pre-event advertising. 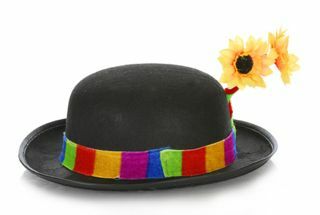 Simply ask kids to make a hat on a rainbow theme. This may be done by decorating an existing hat or starting from scratch. Judges will award marks for design, ingenuity, and use of colour etc. A rainbow hat parade in front of your arch prior to judging is always going to be popular with camera wielding parents. Get the friendly rivalry going amongst the home bakers with a Rainbow Cake Competition. A Prize for the Best - Raffle the Rest. A novel fundraising idea for helping judge this is getting people to buy a voting slip on which they write their name and phone number. They place it in a box in front of their favourite cake. The votes are counted toward the end of the day. A winner announced and a draw takes place for each cake from its voting slips. Not only have people voted for their Number One but they also stand a chance of taking it home! Fundraising event ideas do not have to be complicated. Kids love these little craft ideas at fundraising events. Put the craft area near the refreshment tent and Mum and Dad are happy too! A rainbow worm starts life as an old sock. Stuff it with newspaper or scrap material and tie the end. Then simply wrap strips of brightly coloured material around it and tie them off. You may like to add an elastic string to the middle of the worm (so that you can bounce them along the ground). A pair of stuck on googly eyes either purchased from a craft shop or made from material complete your Rainbow Worm. "Donations in the Rainbow Worm Fundraising Tin please"
Choose your own Rainbow (Knickerbocker) Glory. A clear plastic cup (the larger ones from water coolers are ideal) gets filled with rainbow layers of different flavoured ice cream, tinned and fresh fruit, coloured syrups and sauces. Top your creation off with brightly coloured sprinkles. This is another easy win that the kids will love. The theme is Colour - You can paint or draw anything you want; so long as its the most colourful thing you've ever seen. Either provide pens, paints and paper on the day and have kids set to there and then. Announce the competition in advance and ask kids to bring along their paintings. There's Gold At The End of The Rainbow! 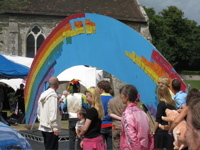 This great fundraising event idea for a Rainbow Festival comes from St Wilfrid's Hospice in Chichester - England. If you have any fantastic fundraising event ideas you would like to share with others all around the world please click here.